Be sure to use room-temperature berries. Cold fruit straight from the refrigerator will prevent your dessert from baking evenly. Position a rack in the center of the oven and heat the oven to 350°F. Line a 9×13-inch metal baking pan with foil, leaving a 1-inch overhang on the ends. Lightly butter the bottom and sides of the foil. In a large bowl, combine the flour, oats, sugar, salt, and baking powder. Using your fingers, blend the butter completely into the flour mixture. Transfer 2 cups of crumb mixture to another bowl and reserve for the topping. Blend the egg white into the remaining crumbs and then press the mixture into the bottom of the pan to form a level crust. You can tamp it with the bottom of a measuring cup to even it out. Bake the crust until it starts to form a dry top, 10 to 12 minutes. Meanwhile, in a medium bowl, whisk the condensed milk, lemon juice, lemon zest, and egg yolk. Let this mixture stand for 5 minutes; it will begin to thicken. Sprinkle the blueberries evenly over the hot crust and then drop spoonfuls of the lemon mixture over the blueberries. Spread gently with a spatula to distribute a little more evenly, but take care not to crush the berries; it’s fine if the lemon mixture isn’t perfectly even. Bake until the lemon mixture just begins to form a shiny skin, 7 to 8 minutes. 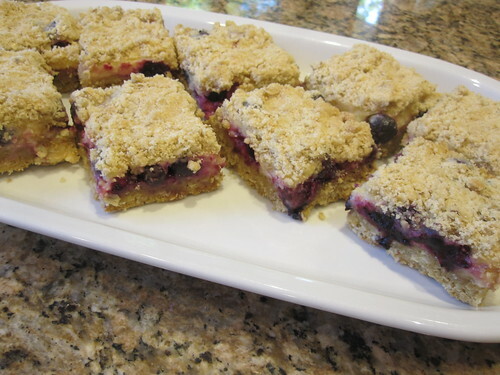 Sprinkle the reserved topping over the lemon-blueberry layer, pressing the streusel between your fingers into small lumps as you sprinkle. Bake until the filling is bubbling at the edges and the topping is brown, 25 to 30 minutes. Let the bars cool in the pan on a rack until just warm, about an hour. Carefully lift them out of the pan using the foil overhang and transfer to a wire rack to cool completely. Remove the foil and cut into 24 bars when cool. The bars may be stored at room temperature for a few hours but otherwise should be kept in the refrigerator.